When you think of an armadillo, the image that usually comes to mind is a ’so ugly it’s cute’, armored mammal that rolls into a ball whenever it is scared. 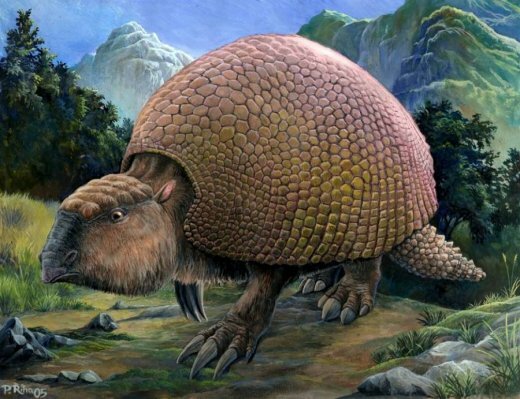 Yeah, that might be the armadillos of today, but back in prehistoric times, it’s ancestor was the glyptodon, and that is a whole other beast. In fact, the ancient version of the critter was the size of a VW bug and could easily crush a human with its clubbed tail. The glyptodon didn’t have segmented scales like modern armadillos. It had one big carapace, like a beetle or a turtle. Still, it must have been a sight to see for prehistoric humans who existed during the same period 5.3 million to 11,700 years ago. Their habitat was spread all throughout what is now North and South America and they were able to adapt to all manner of environments from grassland to tundra. prairies. Most of the currently known glyptodon fossils actually come from theAmazon River basin and the plains of Argentina. One of the coolest things we know about how the glyptodons and humans interacted is that when humans did hunt them, they didn’t let anything go to waste. In fact, they would use their shells as shelter from the elements. In the end, as is so common with a lot of species, it seems that they died off from a combination of overhunting and climate change in the form of an ice age.